If you are a person who is always on the go, then the Sony Xperia Tablet Z is a perfect device for you with the loads of neat features and the amazing specs. The tablet has a smooth and sleek feel to it. It is remarkably thin and light, its thinner than the iPhone 5 and weighs 495g. The 6.9 mm thickness makes it the thinnest tablet available. It features an omnibalance design. The back side has a nice mat finish which makes it a stylish tab. The tablet runs on the all new Android 4.1 Jelly Bean operating system, and the 10.1 inch screen teamed with its efficient features is going to make you really interested in this tab. It features a water resistant and dust proof design which makes it similar to the Xperia Z smartphone. The tablet offers LED backlit LCD and also a decent capacitative touchscreen. The camera is stunning with a 8.1 Megapixel rear facing camera and also a 2 Megapixel front camera. There is also an autofocus and smile detection for better photographs. The display is something that stands out on this device, as it offers a resolution of 1920 x 1200, the display would be crisp. There’s Wi-Fi, Bluetooth and there is also a 4G version on the cards. The interface is just brilliant and you’d enjoy every bit of this tablet. The tablet also offers decent 1080p video recording at 30 frames per second. It supports micro SIM card. The best part of this tablet is its shatter and scratch proof design, which makes this a tablet which need not be treated like a baby. The tablet offers a 2 GB RAM, so performance wise its pretty cool. Strangely, we observed some lag when we were flipping through some of the apps and also saw the animation shake a little bit when we launched the app drawer although internally the Tablet Z is powered by the quad-core 1.5GHZ processor. There is an internal memory of 32 GB and offers a micro SD slot to extend your memory. This tablet can be used as a universal TV remote controller as there is an infrared emitter. 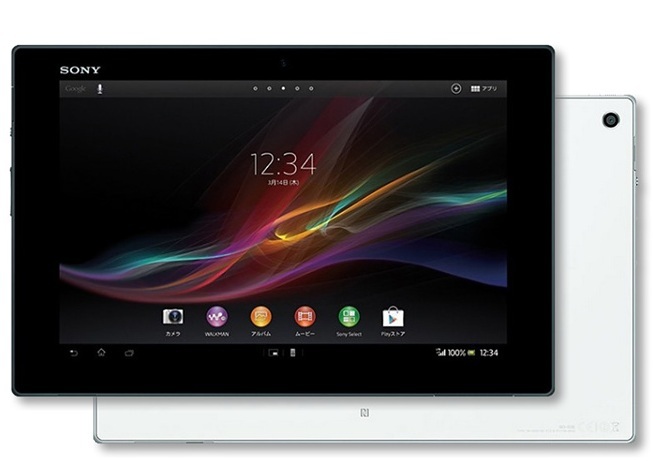 It is made available in the black and white models and the design is pretty similar to the Xperia Z smartphone. All the ports are covered by plastic flaps, to make it dust proof. One thing that’s consistent from the Xperia tablet S, is the dock which is on the top and it allows you to pin different things to it, which makes it a useful feature. The only thing that seems to be a let down is the premium pricing, so its not a budget tablet and you might have to plan a bit before investing in this tablet. Overall, its a pretty good device and the thin and stylish design adds to the powerful processor. The camera is pretty good and the results are positive when shooting low light pictures. The screen is impressive and the water, dust, shatter and scratch proof design makes it a nice tablet to have. The tablet is going to launch in the mid of April 2013, and was showcased at the Mobile World Congress 2013 in Barcelona.